Every year I attend ICAST, the International Convention of Allied Sportfishing Trade, and always come home eager to put the latest gear to the test. Usually it's a new lure, line, rod or reel and to be completely honest, it'll sit on my desk for a couple weeks or even months before I get a chance to wet a hook with the new gear. This year was different. I'd discovered a product that I literally could not wait to test out. Before I even got one to test, I'd told countless people about it, and while I was at ICAST, I sent well over a dozen folks to their booth to check it out. I'd never done that before, nothing had ever gotten me that fired up in the fishing industry. Deeper Fishfinder was the product that I was on the water testing the same day a media sample came in the mail. It's a portable fish finder, about the size of a tennis ball, that you can tie on a fishing line and cast out to check the depth and fish in the area. The new options for fishing were great, but I also saw some awesome ways to utilize it for hunting as well (I'll get to that in a minute). I really see three significant game changers for utilizing Deeper for fishing. My first thought was kayak fishing. The Deeper unit charges via USB, A/C or 12v car outlet, so there's no need to carry an external battery on your kayak, canoe, gheenue or sneak boat, saving significant weight. The portability also makes for easy transport, and removal so you don't have to fret about your electronics going missing while you're grabbing a burger after limiting out on trout and reds. The second application that excited me was shore or dock fishing. It's genius. How many times have you taken your kids fishing, or gone yourself, rolled up to a pond or lake and had no idea what lay under the water? For all you knew, you were throwing your son or daughter's bobber out at 4 foot depth over a 20 foot hole. The fish finder is handy, but personally I use these more for depth. It'd be great out at the lake or pond to be able to find the shelfs, holes and general depth from shore or dock. The third game changer takes the same concept as shore or dock fishing, but from your boat. Your bass boat or flats boat already has electronics, but maybe you roll up on a spot you don't want to (or can't) drift the boat over. Tie on Deeper, cast and see what's down there. You may have asked yourself, or already figured out, how you get the info from the Deeper to where you're fishing. Deeper sends the info via bluetooth to your smartphone or tablet. I've tested it with both my iPhone and my iPad with no problems whatsoever. The app will give you signal strength as not to cast it too far, but that wasn't ever a problem in my testing. The app itself is robust, and definitely worthwhile stand alone. 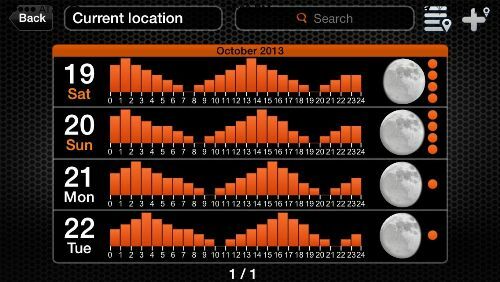 In addition to giving you the depth and fish nearby (with alert tones when a fish swims by) it also has a history you can go back through, GPS for marking spots, weather, a calendar with moon phases and best fishing times, as well as a number of other features for sharing via social media and journaling. It doesn't have to sit stationary either, you'll get real time reporting on depth and fish while reeling it in as well. I also had an opportunity to utilize Deeper for hunting this Fall. When we were scouting for the early Teal season, we floated up on several holes and sloughs that we were seeing for the first time. A cast of the deeper and we knew if the hole was shallow enough for decoys, and when we came back, if we'd need our four foot, six foot or eight foot decoy lines. We also found a couple of holes we knew we'd want to avoid when wading out to pick up decoys. In closing, I’m going to say this is a must have for anyone headed to the water to fish or hunt. It’s easy to use, convenient to charge, and has an app packed with goodies. 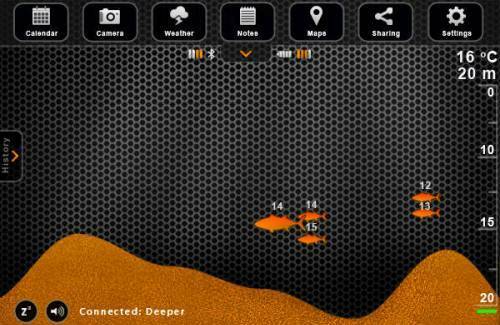 Whether it’s your first fish finder, or an addition to your electronics lineup I’m sure you can think of several situations in which Deeper would be an incredible asset. Not to mention it’s not going to take up much room at all in the boat or tackle bag. Learn more at //www.buydeeper.com/.